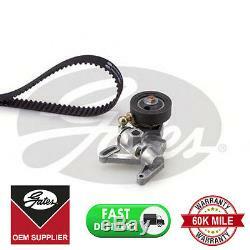 GATES Water Pump & Timing Belt Kit. AEB, ARK, APU, ANB, AWT. AEB, ANB, APU, ARK, AWT. 1.8 T 20V Cupra. 1.8 20V T 4. 1.8 T Cupra R.
AGU, AUM, ARZ, AWD, AQA. AGU, AUM, AWD, AQA, ARZ. APH, AVC, AWU, AWV, AGU, BKF. This kit contains 1x PowerGrip Belt (5491XS), 1x Vibration Damper (T43025), 1x Tensioner Pulley (T43016), 1x Water Pump (WP0052), 1x Installation instructions (I-1107). This is a genuine Gates product and is equivalent to OEM quality. Gates is the global leader in premium timing belts and components. Their products are fitted by vehicle manufacturers and approved garages worldwide. Please use the part number to identify if the part is correct for your car. Any models shown in the application table are just a guide. If a part is faulty a replacement will be sent out after the return and testing of the old unit. Labour claims are never accepted. The item "GATES TIMING CAM BELT WATER PUMP KITKP25491XS FOR AUDI SEAT SKODA VOLKSWAGEN" is in sale since Tuesday, August 30, 2016. This item is in the category "Vehicle Parts & Accessories\Car Parts\Engines & Engine Parts\Belts". The seller is "astrading2016" and is located in PR6 0LP. This item can be shipped worldwide.